QuestGuru is a Quest Log Enhancer. Note: If you like this addon, please "Like it" on Curse.com. All Donations support me and I thank you in advance for it. Added full time quest level in front of quest name and tooltips. Will try and revamp the quest tracker as I love it also. But wanted to get the Log out ASAP. Need to make a in-game config window, still a work in progress. Q. How do I post a Bug Report? A1 - Click on QuestGuru Go to the AddOn and on the right side there is a selection called "Bugs" click on that. You will need to be signed in to WoW Interface to create a bug report. Please include the version of QuestGuru you are using and copy/paste the error message you receive. Please describe what you were doing when the error happened. This will help tremendously. Q. How do I turn on auto-tracking of quests? A - Look in the options for the game itself, not QuestGuru. Under Objectives there are options to set when to track quests. QuestGuru does not duplicate these settings in its own options as it could become problematic and it is not necessary to duplicate options already available. Q. Where can I find a version compatible with WoW patch x? A. QuestGuru is supported for the current Expansion and Patch level running on the live servers. PTR versions may be supported as Alpha or Beta releases, but I offer no guarantee. Now all of my text is dark in the window and impossible to see. 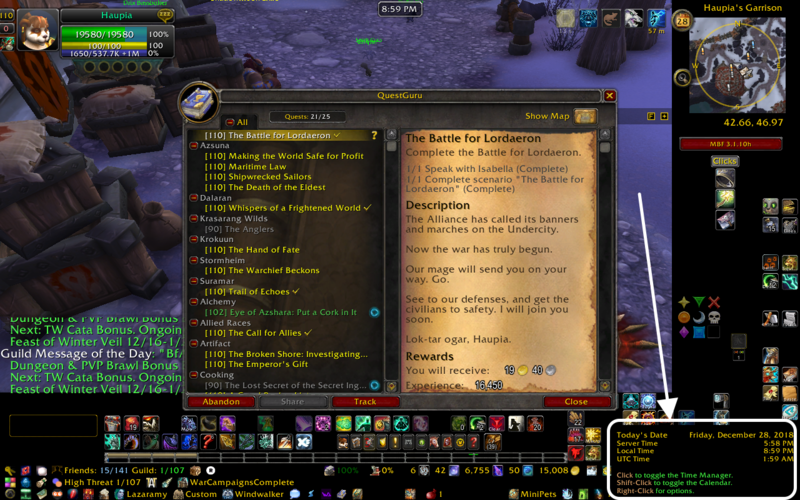 I logged into a couple of my toons today to check this out for myself after making sure that all of my addons were up to date and found that my QuestGuru worked just fine (as shown by the screen shot I took that shows the time and date from a addon showing in the lower right hand corner below in the first spoiler tag). I suggest that you try disabling all addons then turning on QuestGuru by itself to see if it runs OK. If it does then your problem is one of the other addons messing with QuestGuru, but I have not had any reports of that yet. Also make sure that you are running the current v2.5.13. I also have a list of the addons that I have enabled in my WoW setup, though not in alphabetical order shown in the 2nd spoiler tag. It appears to be ELVUI which I just disabled it's control over the QG display and it's all good now. Thank you. How do I get the quest levels back in QuestGuru? I miss having them. Download the newest file "QuestGuru 2.5.13" (via the download button or update via the Twitch app). Not sure how it fubarred to lose the quest levels but is now restored. Thank you very much!! It was such a pain without them!! Sorry about the triple updates today guys. Under the weather and wasn't paying attention enough. Version 2.5.12 is working correctly now. Versions 2.5.10 & 2.5.11 had bugs that slipped by me. Hope you are enjoying BfA as much as I am. thanks again for the updates :). Also the Track/Untrack button text wasn't showing the correct initial value when selecting a quest if the ui was reloaded. I added a condition to set the button text when the quest is selected. QuestGuru.lua - the changed ListEntryOnClick and ToggleWatch functions. I know and am currently working on it. Thank you for this update! Works beautifully! Just a note -- files in the recent updates have been showing up for me with bizarre "date modified" values, with the year being anywhere from 2018 to 2094. Not sure if this affects anything on the user end, but you might want to look into it. So I am not sure where you are seeing the "bizarre "date modified" values". I checked my Twitch app to check it's date for QuestGuru and all was normal. All I can say is it might be something with your comp. I do run a Mac with macOS 10.13.4 (17E202) and do not have any problems with my Date/Time. Hope you figure it out. Not sure exactly which version this is, but I haven't seen the 1969 values before. At any rate, this isn't happening with anything else that I've found. Not sure why you are getting these modified dates but I suspect it's your system doing it. I use BBedit for my Lua editting and have never seen that sort of behaviour before. I opened and resaved all the files today, then took a screenshot of then (below). It's a mystery. The only other files on my system that exhibit these traits are a bunch of things from my dad's old notebook and an ancient Quark Xpress install. In my experience, these weird dates will happen when files are modified on a computer with a dead or dying PRAM battery, but if they're not showing up as wrong on your end I have no idea what the cause might be. I FINALLY found the culprit! I use StuffIt Deluxe Mac 16's StuffIt Archive Manager for my compression since it doesn't include things that the Curse network doesn't like. I happened to forget adding to my revisions text today after I had already zipped the files, so I updated the file and opened it with the StuffIt Archive Manager and BAM! I saw the modification dates were all screwy (picture below in the Spoiler). I am not sure why that app does that but won't be using it in the future. At least that is one niggle that has been solved. I seem to recall having issues like that with the later versions of Stuffit. Sorry to have been a pain about it, but I'm glad the mystery is solved. I love your mod, thanks for keeping it updated. Ever since the update for BfA, I've not been able to move the QuestGuru window. I can't find any options that lock/unlock it. Am I missing it somewhere? I am having the same problem after the last build, will delve into it and get it fixed by next build.